Surrender of fundamental rights articulated in the Constitution to those who demand a monopoly of violence is a reasonable compromise, say the Opposite Day "progressives." 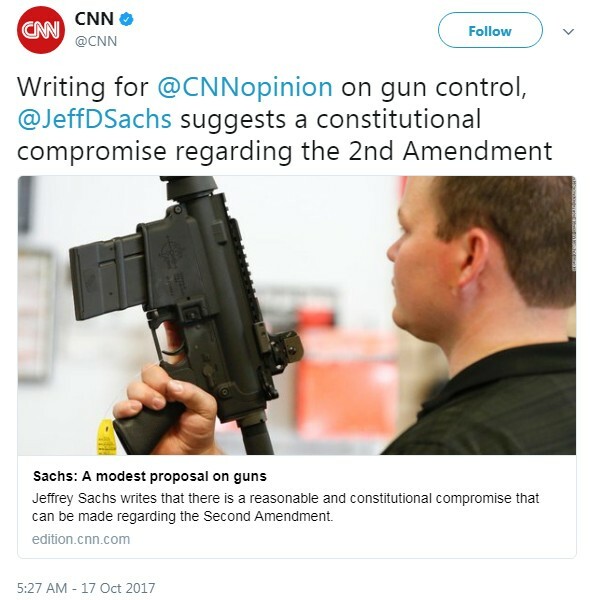 "There is a reasonable and constitutional compromise that can be made regarding the Second Amendment," the CNN summary for its "A Modest Proposal on Guns" guest editorial by Jeffrey Sachs claims. That alone should be enough to put gun owners on their guard-first because, as the tagline says, "This is CNN," and we know what that means. For them to present themselves as arbiters of "reasonable and constitutional" opinions on gun owner rights smells like a set-up to a swindle. When they add the word "compromise," you know what they're pushing (commentary opinion disclaimers notwithstanding) is more infringements, not fewer. The title of the piece ought to give it away. "A Modest Proposal" was an Eighteenth Century satire written by Jonathan Swift in which he proposed the impoverished Irish could improve their economic lot by selling their children to be slaughtered and eaten by the rich. At least in Swift's case, he was mocking the heartlessness of the oppressive establishment elites of his time. In Sachs' case, he is the establishment. He's a professor and director of the Center for Sustainable Development at Columbia University who calls the U.S. "a rogue nation" He's a leading "warmist" who advocated that Texas Gov. Gregg Abbott should resign after Hurricane Harvey because he supports his state's oil interests against (unconstitutional federal) regulation and opposed the Paris Climate Agreement for globalist wealth redistribution. And speaking of Swift and children perceived as liabilities, it's telling that Sachs, along with UN Secretary General Ban Ki-Moon, were hosted at the Vatican to push the benefits of a worldwide tax-subsidized "right" to abortion along with "population control." "Reasonable compromise" on the right of the people to keep and bear arms can be most helpful with that, as multiple Twentieth Century genocides have proven. And the good professor's bright idea this time around? "Focus the protection of the Second Amendment on keeping nonmilitary arms at home for self-defense, while putting an escalating standard of protection on other kinds of arms and uses ... If individuals want to own semi-automatic assault weapons, either as collectors or for practice shooting, then enforce a provision that such weapons can only be kept at legally registered shooting ranges or other registered depositories, and cannot be removed from the designated premises. Similarly, if individuals want to use unusual high-powered weapons for hunting, and if such weapons are deemed to be acceptable for hunting purposes, then require that the hunters collect their weapons from a registered hunting depot and redeposit them after hunting, with the guns and ammunition properly accounted for." There's more, but you get the picture. He has completely eviscerated Founding intent and "shall not be infringed," and reduced gun ownership to highly-regulated personal protection and "sporting purposes," all of which are one majority rule vote away from the ultimate goal at the bottom of Nancy Pelosi's "slippery slope"."